Children extend their hands in prayer with Sr Judith McGinley op to bless and launch a new book: If Dominic Came to Visit. It’s 800 years since the Order of Preachers was founded to follow in the footsteps of St Dominic. 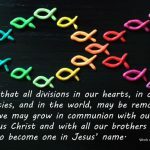 A year ago, the Dominican Family in Aotearoa-New Zealand celebrated the end of a year of Jubilee. 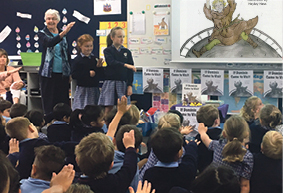 One year later, some 80 junior school children at St Brigid’s in Johnsonville listened with excitement to the story of Dominic. 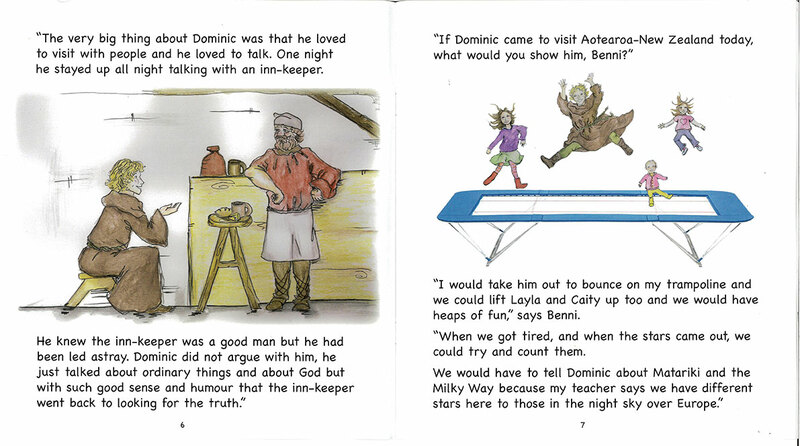 It was retold from a new book, If Dominic Came to Visit, in a format ideal for early or new readers and for reading aloud. The story is about St Dominic and the Dominicans and is presented, in part, in a New Zealand context of today. The children quickly realised the characters in the book included two of their classmates, Benni-Rose and Caitlin – and it wasn’t an accident! This delightful book is superbly written by the girls’ Nana Michele and beautifully illustrated by their Aunt Hayley. 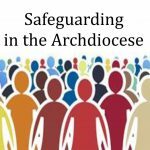 There was laughter and prayer as the book was launched and blessed by the children extending their hands and praying with Sr Judith McGinley op. The children loved the picture of a modern Dominic bouncing on a trampoline. He is wearing a brown habit rather than a traditional white one. 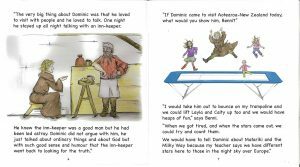 While we don’t know what Dominic may have worn back in his day for picnics or gardening or going on adventures around the world, we do know he was a good and saintly man. And we think when he was a lad, he would have loved all the things children enjoy in our beautiful world today. Copies of the book can be ordered from email: micheleness@outlook.com for a suggested donation of $10 each (please ask for tax receipt if required). All book sale proceeds are for Dominican projects in New Zealand, Australia and the Pacific to help with resettlement, education and material needs of refugees. 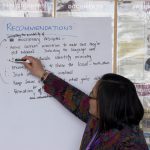 Maggie Johnson is Director of Religious Education, St Brigid’s School, Johnsonville, Wellington.